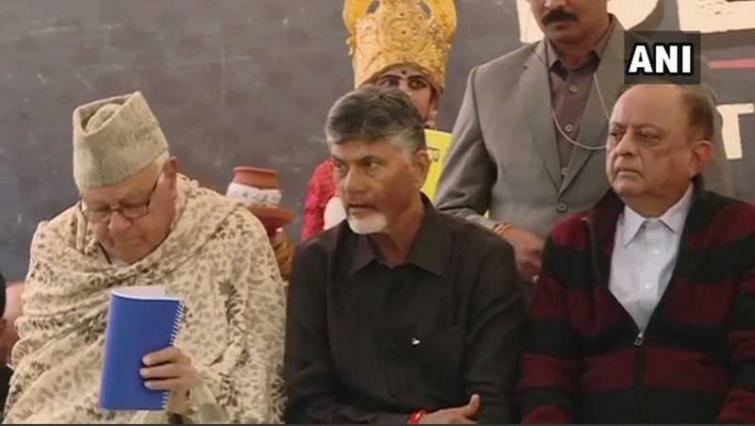 New Delhi, Feb 11 (IBNS): A line of opposition leaders appeared in Andhra Pradesh Chief Minister Nara Chandrababu Naidu's day-long fast which was called at the Andhra Bhavan here on Monday over the demands of a special status for his state. Congress president Rahul Gandhi, former Prime Minister Manmohan Singh, Samajwadi Party president Mulayam Singh Yadav, former Jammu and Kashmir Chief Minister Farooq Abdullah, Delhi Chief Minister Arvind Kejriwal, TMC Rajya Sabha MP Derek O'brien were present at Naidu's fast. Naidu-led TDP had pulled out of the NDA in March last year over the issue of granting special status to the southern state. Prime Minister Narendra Modi on Sunday slammed Naidu during his address at Guntur rally and said the Andhra Pradesh Chief Minister is creating lots of wealth for himself and his son while the state suffers. Speaking at the rally, the PM launched a fierce attack on Naidu and said: "One must admire Chandrababu Naidu Garu’s honesty. He says he is a wealth creator! He’s obviously creating lots of wealth for him and his son while AP suffers. We are patriotic Indians...we are only thinking about the nation. Creating wealth is never on our minds." Modi said the people of Andhra Pradesh have seen the true colours of Chandrababu Naidu. He said: "Chandrababu Naidu Garu keeps saying he is senior to Modi, he is senior to Modi. Of course he is...Know how!" "My ‘senior’ in politics, Shri Chandrababu Naidu obviously has lots to hide. 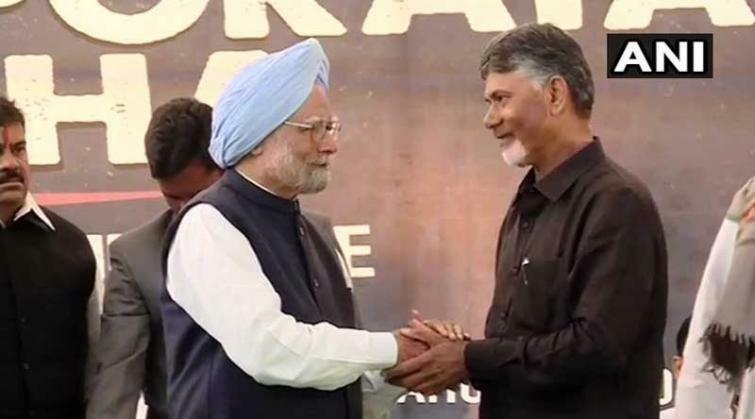 Else why won’t he give an account of what his miserable Government has done for Andhra Pradesh," said he. Modi claimed that the Centre has left no stone unturned for the state’s progress but the priorities of the TDP are different. Taking a dig at TDP leaders for protesting against his visit to the state, Modi said: "I thank the TDP cadre and their leader for wishing what every patriotic Indian also wishes- that Modi goes back to Delhi and once again becomes the Prime Minister! I guess they have read the writing on the wall!" While interacting with NDTV on Monday, Naidu said he is proud of his family but it is the Prime Minister who has no one. "He speaks about triple talaq bill, but what did he do (to his wife)?" added the Chief Minister.